NEXUS Asia was founded in 2011 and convened the first NEXUS Summit in 2012 in China. Since then there have been eight country and regional summits. The NEXUS Asia community has grown to include members in Hong Kong, Indonesia, Japan, Malaysia, Myanmar, Philippines, Singapore, South Korea, Taiwan, Thailand and Vietnam. NEXUS Asia strives to create a supportive community of young leaders challenging the status quo and working towards a sustainable future through family business, impact investing, philanthropy and social entrepreneurship. Connecting the financial, intellectual, creative and social capital of our generation in an action-oriented, solutions-focused and safe space, the NEXUS Asia aims to inspire learning and collaboration between a uniquely powerful network of peers. In a region that has undergone incredible transformation and growth NEXUS Asia host frequent salons to discuss how best to deploy wealth and resources to support innovative solutions and meet the challenges facing the region today. under-served parts of Asia, Europe and North America with organizations such as Medecins Sans Frontieres/Doctors Without Borders, PSI, Save the Children, World Bank and World Health Organization. In 2009, as one of the early key staff at a Hong Kong-based venture philanthropy foundation, Abbie was at the forefront of the budding social entrepreneurship and social investment sectors in Asia. She co-founded Synergy in 2011 to address critical capacity building and financing gaps for early stage social ventures in the region. Abbie serves as advisor or director to many social initiatives/organizations such as the Coalition of Asian Pacific Americans, iBoP Asia, iOnPoverty, Philanthropy in Asia Summit and Asian Social Entrepreneurs Summit. She is passionate about developing the culture and practice of innovative and strategic philanthropy in Asia to support both traditional and new social change models (like social entrepreneurship) as a means to creating a more just and sustainable world. eyeglasses to students in low-income communities in China. Since 2014, she hasbeen deeply involved in building the NEXUS China community and has served as NEXUS China Country Director since 2015.
every community in which it operates. For example, SPB regularly donates its products to those in need and provides relief to the unfortunate during times of natural disasters. In addition to his main responsibility, Naps is also the Sponsorship Manager of the Bangkok Charity Orchestra (BCO), Thailand’s first and only orchestra dedicated to raising funds for charities; a Director of the Thai Young Philanthropist Network (TYPN), a group of over 2,300 young, highly educated professionals in Thailand whose aim is to be a key development agent for the country; and the Secretary of the Boss Association, a group of over 3,000 leading Thai executives whose objective is to make a positive impact on Thailand. Naps, a Cambridge-Thai Foundation Scholar, holds a Post Dip in Economics from Downing College, the University of Cambridge, and a BSc (Hons) in Physics with Theoretical Physics from the University of Manchester. He was given the Model Business Person of the Year Award (Household and Office Goods Sector) from the Foundation of Science and Technology Council of Thailand in 2012.
the ageing sector in Singapore. Rebekah was on the committee of the Yellow Ribbon Fund from 2011-2015 and served as a main committee member of Community Chest of Singapore for 2 years before moving to London where she has now taken on an ambassadorial role. She has also been running her family foundation, Jia Foundation since 2013. She was selected to be a Leader of Tomorrow at the 2015 St. Gallen Symposium and was also recently selected as 1 of 18 Young Societal Leaders by the SMU Institute for Societal Leadership and Temasek Connects for the Singapore Summit. Rebekah graduated from Nanyang Technological University with an honours degree in Business Administration and has completed an MA in Creative Writing from Birkbeck College, University of London. She is currently pursuing her MSc in Gerontology at King’s College London, has been nominated as an Ambassador for the King’s Global Health Institute and was a speaker at the TedX KCL conference in November 2018. She has also completed the Executive Education program at Singularity University in November 2017.
clinical and policy-related positions with an interest in family and community medicine. impact projects including: working with an EdTech startup to scale its technology to reach 20,000 students and implemented an accelerator for 100 emerging social entrepreneurs to scale their social enterprises in areas of education, health, agriculture, and community based tourism in partnership with JP Morgan Global Philanthropy. Prior to G-Lab, she worked at Ashoka and IDEO.org. Viria received graduate training in human-centered design from the Stanford Design Institute (d.school). Viria was named Global Shapers by the World Economic Forum in 2015, selected as a Curator in 2016, and in 2017 represented the global shapers community as a speaker on the topic of Social Entrepreneurs: Agents of Systems Change at the World Economic Forum in Davos. 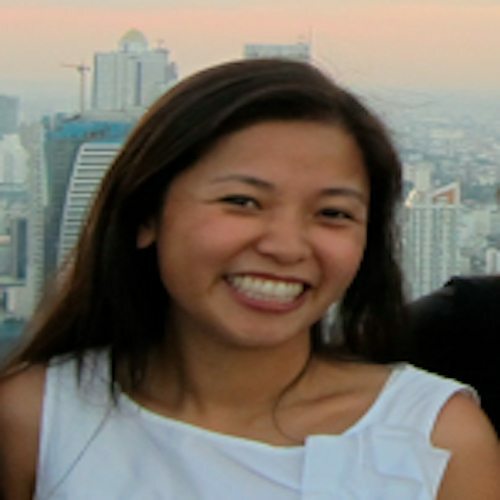 In addition to her work, she is an Advisory Board Member for the Arts and Humanities Research Council for Service Design & Social Innovation, Asia-Pacific and a Program Advisor, Designing for Social Innovation and Leadership program for the UN University of Peace, Faculty Council at School of Global Studies, Thammasat University, and Co-Country Director of NEXUS Thailand. She is interested in working with organizations, both public and private, to greater their social impact/ innovation, and improving the quality of education in Thailand and the region at large. Over the past few years, NEXUS China has organised many events covering issues that interest the community including the environment, education, women, children, social enterprise, social impact, business for good, family heritage, food safety and many others. Special salons with The Rockefeller Foundation, The Gates Foundation, UN Social Impact Fund and SEE Foundation have helped our members learn about the ideas, experiences and journeys of philanthropic icons. We convened field trips all over China, including in Beijing, Guizhou, Qinghai, Shanghai, and Yunnan so our members can have firsthand experiences with problems we are facing in our country. The first NEXUS Asia Summit was held in Beijing in 2015 where we discussed ways to create a sustainable future for Asia. Our recent 2018 New Year Forum had inspiring discussions about how the next generation is taking social responsibility, new movement of B Corps in China and being a changemaker in China. We are planning many more exciting activities for 2018. Please contact Yoyo Yan, NEXUS China Program Director for more information about NEXUS China. Interested in joining or sponsoring the NEXUS Asia network? Are you an exceptional young social entrepreneur, philanthropist or impact investor based in the region? Interested in using philanthropy and social entrepreneurship to and shape the future of Asia with an unparalleled network of peers? We’d love to hear from you. Please send us a message and we’ll be in touch shortly.